The TS II have relatively quadratic blades and are available in any width. (The most requested model.) Due to their special shape, the blades´ edges don´t collide with each other during the leg kicks. Fins are plastic footwear including a foot pocket and a flexible blade, whose movement through the water propels the diver forward with relatively little effort. Fins are used for scuba, free diving and snorkeling. Standard equipment in nearly all types of diving, they are particularly useful in a current or when carrying heavy gear. There are also stubby models for surfing and other wave sports. 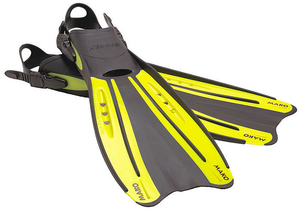 Fins are made of plastic or plastic/rubber combinations in a variety of sizes. Full-foot models enclose the entire foot in a pocket, though there is a small opening at the front for the toes. They are usually worn barefoot, but may accommodate thin booties or socks. Adjustable fins are often closed at the front and always open at the back, except for an adjustable heel strap. These are almost always worn with booties. Extremely long, supple fins offer great propulsive power for free diving, while scuba models are more compact. Different blade configurations, including split blades and those with slots to reduce drag, can be matched to individual physical capabilities and type of diving. Proper selection requires matching fin model to type of diving, whether scuba, free diving, snorkeling or a combination. Fin size will, of course, be a function of foot size.